Where in the World is Mrs. Fucoloro? : Buon Giorno from the Rialto Bridge! Hello from the Rialto Bridge! 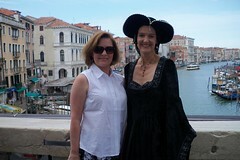 This is Debi, our tour director, and I on the Rialto Bridge. Venice is the most unique city I have ever visited. It is an even more exciting experience than I thought it was going to be. I didn't realize it covered so much area. Everywhere you wander, you come across a quaint little winding street that has shops and restaurants. Debi took us on a vaporetto ride up part of the Grand Canal this morning (off tour). Along the way we got to see prime examples of Gothic, Renaissance and Baroque Palaces. It was a great way to sort of interact with the locals because the ride was early, leaving the dock in front of our hotel at 8:30 a.m. Most of the people boarding and disembarking were locals going to and from work or perhaps, Mass. We disembarked at the Rialto Bridge and walked back to St. Mark's through the city's charming alleyways. Then, Debi escorted us to the Murano Glass mainland shop and demonstration facility. The glass blowing demonstration was very interesting. I learned how to spot an authentic piece of Murano glass, what chemicals are used to change colors, two techniques for creating mosaic glass, how to make a sculpture, etc. Then, I was bullied into picking out a piece for my birthday. The piece is being mailed home and should arrive in 4 to 6 weeks. I can't wait to see it. To see a picture of the piece, go to my Flickr account by clicking on the picture of Debi and me on the Rialto Bridge and click on the Italy set. The rest of the day we walked around Venice, soaking up the city and enjoying a glass of wine here and there along the way. Tomorrow we're off to Florence!